When a columnar object (object that generates vortices) is placed in the flow path of a fluid, regular channels of vortices, called Karman vortex channels, are generated at the back of the object. Since the frequency of a vortex generated is linearly propor-tional to the flow velocity within a given range, the flow amount can be measured by counting the number of vortices. When the frequency of each vortex generated is detected by the incorporated vortex detector (piezoelectric device), the signal processing circuit outputs a signal which is linearly pro-portional to volume flow. ・Because of no moving part, the meter has superior reliability and dura-bility and no error in mounting position is produced. ・Simple construction (its flow path of fluid contains a columnar object and a vortex detector only) ensures low pressure loss and low liquid leak. In addition, the detector does not get into contact with the fluid running through the path, therefore, it is ideal for process monitoring of various liquids. ・Two types of particle-free body materials (PPS and PFA) are available for choice according to your needs. 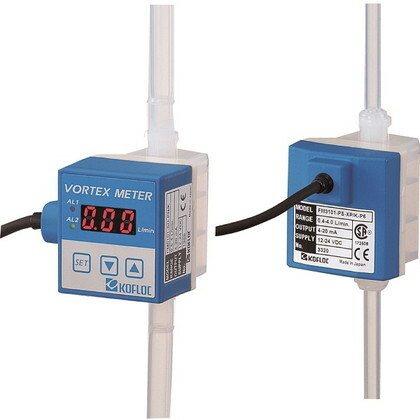 ・Since Teflon is the material for the entire wetted part and no O-ring is in use, the Model31 Series Karman Vortex Flow Meter is optimum for mon-itoring liquid flows in the manufacturing process of semiconductors.